Electronics rely on the movement of negatively-charged electrons. Physicists strive to understand the forces that push these particles into motion, with the goal of harnessing their power in new technologies. Quantum computers, for instance, employ a fleet of precisely controlled electrons to take on goliath computational tasks. Recently, researchers at the Okinawa Institute of Science and Technology Graduate University (OIST) demonstrated how microwaves cut in on the movements of electrons. The findings may contribute to future quantum computing technology. The logic operations of normal computers are based on zeros and ones, and this binary code limits the volume and type of information the machines can process. Subatomic particles can exist in more than two discrete states, so quantum computers harness electrons to crunch complex data and perform functions at whiplash speed. To keep electrons in limbo for experiments, scientists capture the particles and expose them to forces that alter their behavior. In the new study, published December 18, 2018 in Physical Review B, OIST researchers trapped electrons in a frigid, vacuum-sealed chamber and subjected them to microwaves. The particles and light altered each other's movement and exchanged energy, which suggests the sealed system could potentially be used to store quantum information – a microchip of the future. "This is a small step toward a project that requires a lot more research—creating novel states of electrons for the purpose of quantum computing and storing quantum information," said Jiabao Chen, first author of the paper and a graduate student in the OIST Quantum Dynamics Unit, led by Prof. Denis Konstantinov. Light, composed of fast, oscillating electric and magnetic fields can push around charged matter it meets in the environment. If light vibrates at the same frequency as electrons it encounters, the light and particles can exchange energy and information. When that occurs, the motion of the light and electrons is "coupled." If the energy exchange occurs more quickly than other light-matter interactions in the environment, the motion is "strongly coupled." Here, the scientists set out to achieve a strongly coupled state using microwaves. "Achieving strong coupling is an important step towards quantum mechanical control over particles using light," said Chen. "This may be important if we want to generate some non-classical state of matter." To observe strong coupling clearly, it helps to isolate electrons from misleading noise in their environment, which arises when electrons collide with nearby matter or interact with heat. Scientists have studied the impact of microwaves on electrons in semiconductor interfaces in which a semiconductor meets an insulator, thus confining the movement of electrons to one plane. But semiconductors contain impurities that impede the natural movement of electrons. No material is completely devoid of defects, so the Quantum Dynamics Unit opts for an alternate solution – isolating their electrons in frigid vacuum-sealed chambers fitted with two metal mirrors that reflect microwaves. The chambers, small cylindrical containers called cells, each contain a pool of liquid helium kept at a temperature close to absolute zero. Helium remains liquid at this extreme temperature, but any impurities floating inside the substance freeze and cling to the sides of the cell. Electrons bind to the helium's surface, effectively forming a two-dimensional sheet. 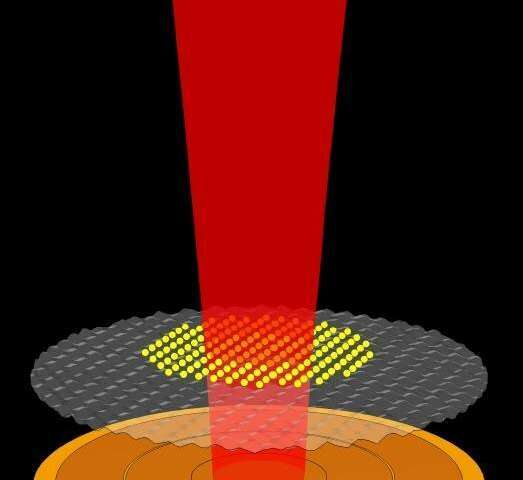 Researchers can then expose the waiting electrons to electromagnetic radiation, such as microwaves, by capturing the light between the two mirrors within the cell. This relatively simple system revealed the influence of microwaves on the rotation of electrons—an effect that had been invisible in semiconductors. "In our set-up, we can determine the course of physical phenomena more clearly," said Dr. Oleksiy Zadorozhko, an author on the paper and postdoctoral scholar in the Quantum Dynamics Unit. "We found that microwaves had significant influence on the movement on electrons." The researchers hope that in the future, the liquid helium system will grant them precise control over electrons, thereby allowing them to read, write and process quantum information similar to how we store standard data on a hard drive. With enhanced understanding of this system, the Quantum Dynamics Unit aims to improve upon the industry standard for qubits – bits of quantum information. Their efforts may lead to the development of faster, more powerful quantum technologies.